Something that I say a lot on CPRW, Canada is like a conveyor belt for churning out really good punk rock bands. The latest one to come to my attention is Toronto's Hangtime. We came across the pop punk four piece scrolling through the Bandcamp discovery section (seriously more people should do this, you come across some real gems) and quickly fell in love with their new EP Invasion which was released on the 1st of March. Invasion begins with an introductory track of the same name before leading into the first proper song, A Thousand Years Ago. This is a melodic pop punk song in similar vein to bands such as Teen Idols or Squirtgun. The sugary sweet vocals are what really grab you at the start of the track. The song is filled with hooks and it won't be long until you're singing along with the band. It's about wishing you had told someone you loved them and regretting not doing it. A strong start to the EP. Next up is One Nine Nine Five. Something I really enjoyed on my first listen of this song was the use of the dual vocals. One of Hangtime’s vocalists takes the verse and the other the chorus. The contrasting pitches of their vocals works so well here. On the bridge, before that epic guitar solo, the vocals come together to produce a superb sounding harmony. The track is about reminiscing over the past and thinking about how some things haven't changed for the better. See You Soon has more of an early 2000s pop punk vibe, the kind of song you'd find in an American teen movie montage. Despite that description, it's actually quite a sad song about missing someone you care for and beginning to struggle mentally. The song is played at a mid-tempo so seems to lack a bit of energy but is full of hooks that will quickly take up residence in your brain and will have you singing it to yourself long after the song has finished. The fifth song, Can I Take You Out, however does have that energy that I'm always looking for in my punk rock. Another song about girls, only this time Hangtime talk about meeting someone new and becoming completely infatuated with them. There's a nice positivity and sweetness that you don't often find in pop punk songs about girls. Sometimes the pop punk guy does get the girl. The fast buzzsaw style guitars compliment the melody driven vocals superbly, this is what gives the track that infectious energy. The penultimate track on Invasion is She. It's not a Green Day cover. On my first listen of the EP She stood out as it reminded a bit of skate punk legends No Use For A Name, starting out in an upbeat manner with some crunching guitars before some deliciously melodic vocals come in. The very first word sounds as if the singer is really straining which really dragged me into the song – it made me really want to care about the song. This track is about having someone in your life who just makes things so much better – what a great feeling that is. I particularly enjoyed the lyrics "she makes the voices stop, she keeps me clear and calm." The seventh and final song on the EP is titled Lucky. 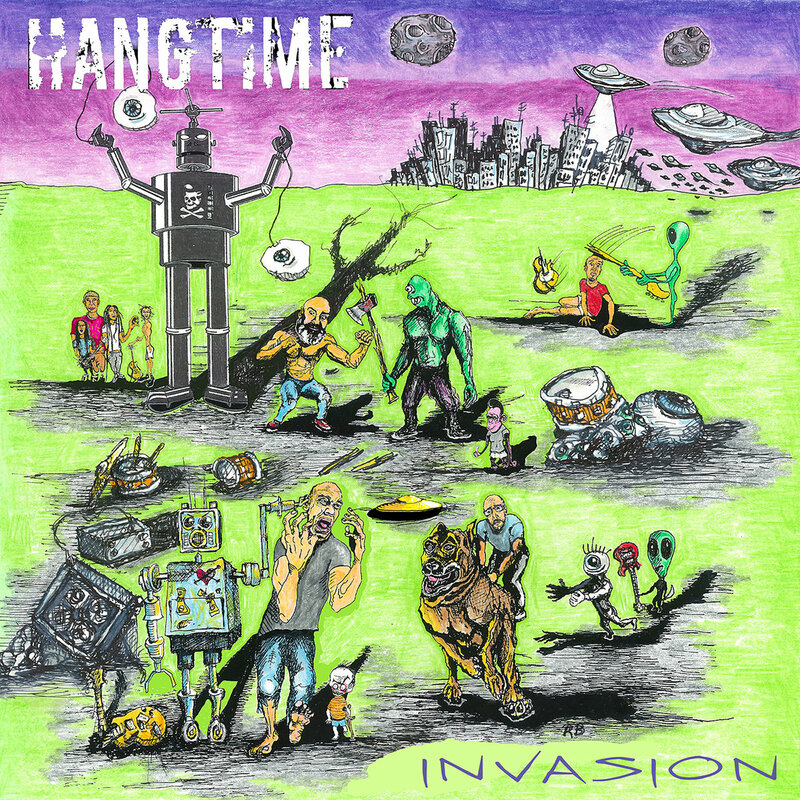 This track ensures that Invasion finishes in an emotional way as Hangtime play another song where they talk about how lucky they are to have someone who looks out for them. It feels as if there is more urgency in the singer’s voice which is what adds the emotion to the track. The ending of Lucky slows things down so it basically sounds like an emo pop ballad. Quite the way to finish the EP. Invasion is a lovely nugget of pop goodness. The main strength of the EP for me is the dual vocalists that give it a freshness and I love it when they sing together – I love a harmony. If you love the poppiest of pop punk then this EP is really worth your time.